I would prefer my “F” words include these: Fearless, Fun, Fabulous, Flair (not Flare), Fit, and Food. I try to manage my condition with Fitness and healthy Food choices, rather than drugs. I am a Fibro-Warrior! My condition doesn’t always allow me to be Fabulous, Fearless, Fun, or have Flair, but when I feel good I try to be the best version of me I can be. And some days, that’s all we can ask of ourselves. 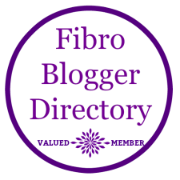 Here are some other Fabulous Fibro Bloggers you should check out. Lee at Fibroblogger Directory has assembled a great list of other bloggers linked on her site (55 Fantastic Fibromyalgia Blog Names). Please check some of them out if you want to learn more about life with fibromyalgia. Updated from a post in March, 2016. Thanks, love! 💜 Had a rough week with a few sleepless nights and fibro pain. Haven’t had much energy to write so I decided to update an old post. 💜 That is the best “F” word ever!